Proven Safe & Effective. MediWhite™ Professional Tooth Whitening Kits include all the things you need to get in-office whitening results, safely, at home. Research & Development. By developing a thorough understanding of the chemical interactions between oxidizers and stains, we have developed two gels that are perfectly balanced to give you the results you want without unnecessary risk. Plain hydrogen peroxide gels cannot penetrate the tooth enamel. They only remove surface stains but not the deep staining that comes from years of drinking dark liquids, smoking, and dyes common in foods. Our special hybrid gels whiten the surface but they also penetrate deep into the transparent part of the tooth to whitening stains that have been building up for years. 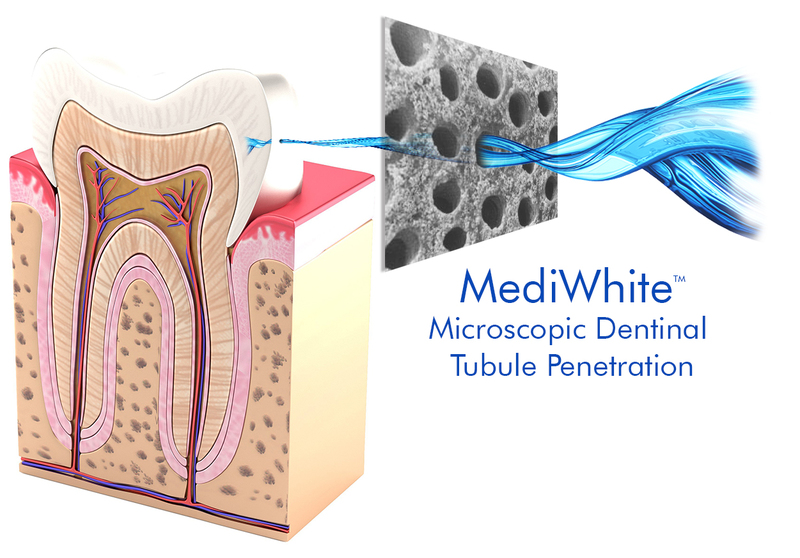 Above: MediWhite™ tooth whitening gels whiten both the surface and deep under the surface by penetrating the microscopic holes that are in tooth enamel. Once inside the tooth, the whitening effect continues for a time even after the gel has been removed.